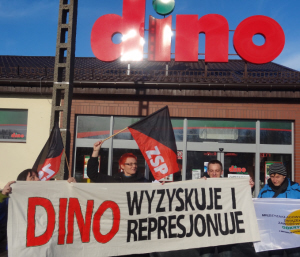 Stop union repression in Dino supermarkets! For better working conditions and freedom to organize! 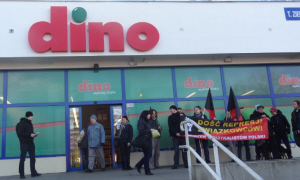 At the end of 2013, Dino Supermarkets terminated the employment of the workers who had organized a trade union. In January, 6 more workers lost their jobs, 3 of them for making comments of liking the union Facebook page. Dino, together with Solidarity union, have come to agreement to discourage any worker protest in the market and have effectively isolated one worker who refused to stay quiet on the requests of the Solidarity leadership. She is fighting for her reinstatement at Dino instead of just looking for another job like the yellow union bureaucrats want. In response to union organizing efforts, Dino not only terminated the employment of union members but also got people from their head office and management to register another yellow union. 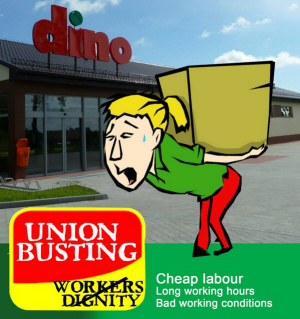 ZSP calls for a boycott of Dino Supermarkets, which offer poor working conditions and violate the basic freedom of association and speech of its employees. It also calls for immediate reinstatement of Magda to her former position. ZSP also criticizes the actions of the regional Solidarity leadership which decided to sell out the workers who wanted to protest and fight to change their working conditions. Read more about Stop union repression in Dino supermarkets!